VietNamNet Bridge – There are many risks threatening specialities of the Mekong Delta -- the coconut trees of Ben Tre, Nam Roi grapefruit of Vinh Long, Basa catfish of An Giang and linh fish of Dong Thap Muoi. Hydropower dams, especially hydropower projects built on multinational rivers like the Mekong, continue to be a sensitive issue. The construction of Don Sahong dam on the main stream of the Mekong River, proposed by the Lao government, is in the consultation stage. 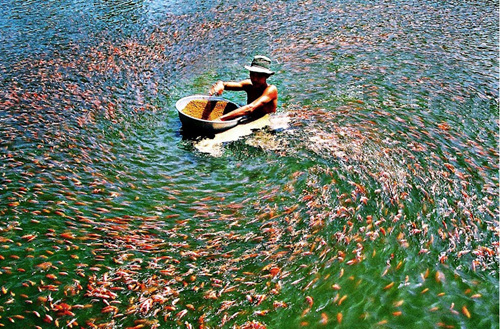 Raising fish in the Mekong River. With a length of about 4,909 km, the Mekong River flows through China, Myanmar, Thailand, Laos, Cambodia and Vietnam. In the territory of Vietnam, the Mekong River Delta is a rich and beautiful plain and the biggest granary. The plain every year is enriched with a large amount of silt in a total of more than 150 million tons of alluvium mixed in 475 billion cubic meters of water flowing through the region before running into the sea via nine estuaries. Currently, the Ba Thac estuary in the Hau River has disappeared due to sedimentation, while the Ba Lai Estuary in the Tien River has been closed for irrigation. The lower Mekong River (in Cambodia, Laos, Thailand, Vietnam) with approximately 606,000 km2 provides shelter and livelihoods for around 60 million people with abundant water resources and endemic ecosystems. With abundant water resources and geological characteristics, the Mekong basin is ideal for hydropower development on both tributaries and the main stream. The estimated total hydropower capacity of the downstream area is about 29,760 MW, of which 2,612 MW is being exploited. Of the more than 120 hydropower projects that have been and are being implemented, 70% of the projects are located on the territory of Laos, 10% in Cambodia and the rest in Vietnam. Due to the needs of economic development and energy security, despite the warnings of ecological imbalance and environmental changes caused by hydropower on tributaries, the riparian countries are urgently exploiting this "clean" energy with 71 dams that have been and are being built on the tributaries. Many more hydropower projects have been planned in the remaining section of the river. Because most of the tributaries are entirely located in the territory of a country, it is difficult for international or regional organizations to raise their voices when new dams are built on tributaries of the river. We are proud that the Mekong River and the Amazon are the rare remaining rivers in the world that still retain the natural flow in the mainstream (downstream). So it is time that member states should be interested in hydropower potential on the mainstream. In 2011, when Laos introduced the Xayaburi Dam for consultations with member countries of the Mekong River Commission, there were many concerns about the negative impact that the dam could cause for the river and its ecosystems, particularly the downstream, including Vietnam’s Mekong Delta. The investors said that Vietnam should not worry about it because the dam was designed as a spillway and it is far away, 1,930 km, from the Cuu Long estuary of Vietnam. The sensitive diplomacy between the state members of the Mekong River Commission helped Laos overcome his contrary opinion and the worry of riparian communities to continue the project. The result is that the dam has appeared. If such a Xayaburi dam is not too threatening to Vietnam’s granary, which is what people are afraid of and have predicted - the principle of "a good beginning makes a good ending” really started when Laos was taking consultations on the construction of the second dam on the mainstream – the Don Sahong dam - (adjacent to the border with Cambodia and quite close to Vietnam). Which of the remaining dams will come after the Don Sahong? Firstly, the dams will make the flooding season in the Mekong Delta shorter, causing significant losses to the crop and fish output. When hydropower reservoirs store waters, the hydrological regime will change, affecting the crop structure. Secondly, according to Peter Adamson (2009), after all eight dams in China are completed, 90% of the alluvial volume from this area contributing to the Mekong River will be blocked. With 11 dams in the downstream, the Mekong Delta of Vietnam will lose about 90% of the total silt volume. Lack of sediment will cause sedimentation and reduction of the fertility of the fields in the Mekong Delta. Sediment reduction also means a reduction in the primary biological productivity and thereby adversely affecting fisheries production, which affects the food security of the region and the livelihoods of millions of people. Thirdly, the dams also create artificial walls preventing fish migration or changing the ecosystems and habitats of many species of fish or making sedimentation in the deep areas where are the ideal environment for many fish species. In particular, the loss of nutrients will have a significant reduction in aquaculture production in the Mekong Delta. There are many other influences such as water transport, tourism, water quality and social environment that cannot be listed all in one article. And many, many more risks are threatening coconut trees in Ben Tre, Nam Roi grapefruit in Vinh Long, Basa catfish in An Giang and ca linh fish in Dong Thap Muoi. The social and economic influences could be resolved through extensive and more consistent cooperation mechanisms through the will and willingness of countries. The most problematic issue is that it is easy to build dams, but it is hard to destroy them. Let’s take action before it is too late to save not only a river and a granary, but also future generations.